Mandarin Ducks are always in couple with their lovers. They would have only ONE lover in the lifetime. Little Beetle is just as cute as the little baby. 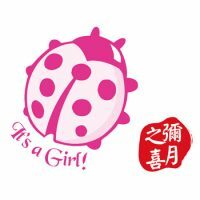 It celebrates the joy of having a new family member. Crane is bird of God in Chinese culture. And is a symbol of long longevity. Colorful chinese paper cutting pattern with Chinese calligraphy of longevity "壽" to create a joyful atmosphere. 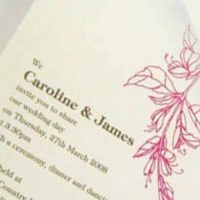 This lovely wedding invitation features two birds dancing to celebrate the marriage of the couple. 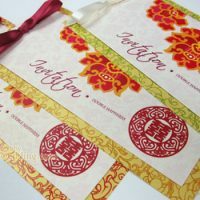 A perfect option for couples who want to add a Chinese touch to the invitations. 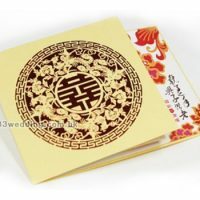 When you are having a Western style wedding invitation, it would be nice if you would match the Red pocket with some fusion between Chinese & Western style. A new design of Merry Christmas Wedding Card. Lots of couple decide to have beach wedding. This flip-flops invitation is a good choice for you. 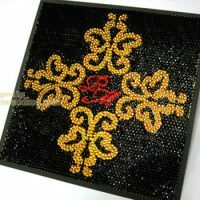 You would like to have special wedding invitation, this invitation might be your choice if you like the idea of bling-bling. Pink color flowery pattern is simple. 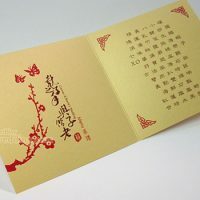 Yet, it creates a really elegant wedding invitation. 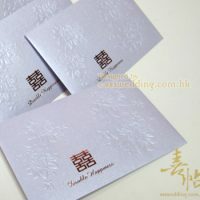 Traditional paper cutting pattern with smilingly double happiness symbol celebrate the joy of getting married. 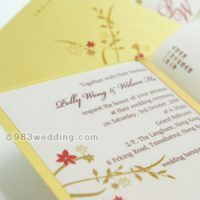 Two blooming flowers dancing on the invitation, symbolize the couples fall in love and decide to getting married. 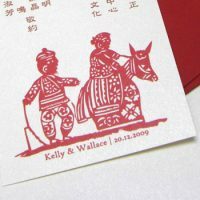 This is a Chinese traditional paper cutting character - Couple singing side by side. 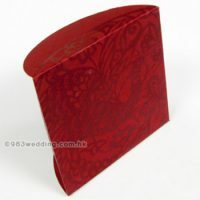 A beautiful red color Lai See Envelope. 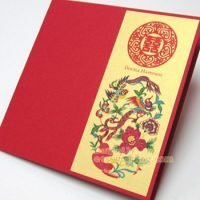 It is a little pocket to enclose money as the gift to the guests in Chinese culture. Airplane ticket wedding invitations will be perfect for overseas weddings. Guests would receive a plane or airline ticket issued by YOU. 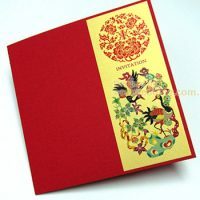 The main color theme of this elegant wedding invitation is red. 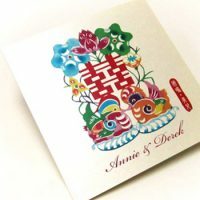 Rich and colorful paper cutting pattern in Chinese style depicts a pair of birds singing to celebrated the union of the newly-wed.
Mui flower in pink color creates a simple Chinese style. It is a good choice announce your wedding to all your friends and relatives.